Happy belated Valentine’s Day! 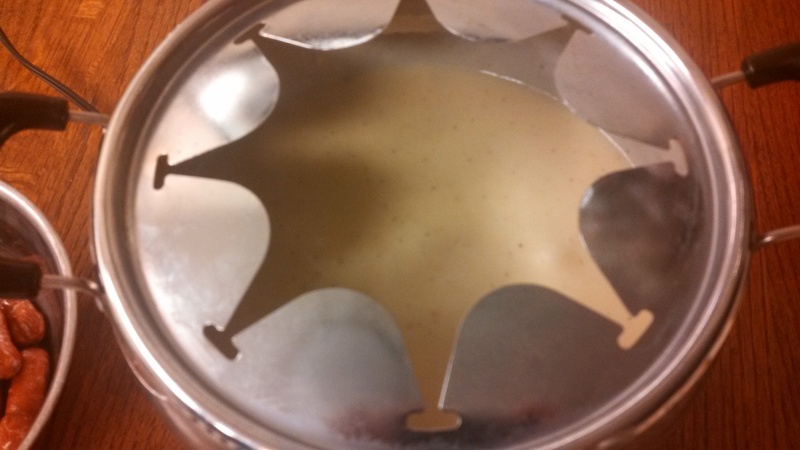 My husband and I have officially adopted a fondue tradition for cupid’s holiday…our first year together, we went to the Melting Pot, and realized that’s one of those rare occasions, due to the price (but it’s AMAZING), so last year we made this wonderful swiss and gruyere fondue at home. 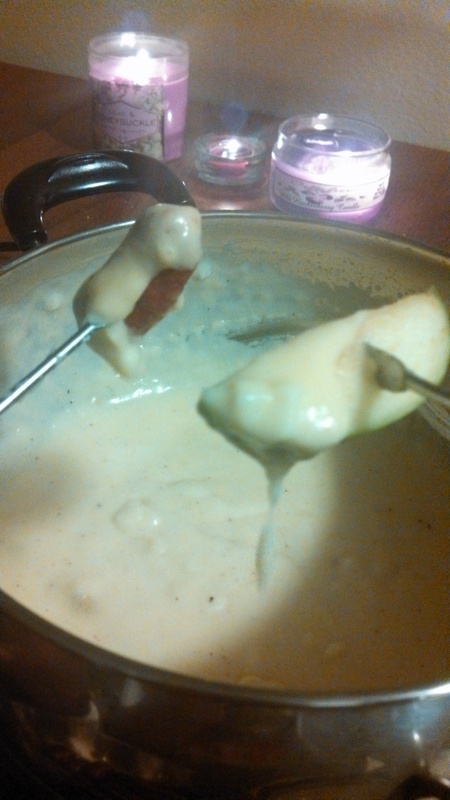 I scoured the Internet and Pinterest this year for the perfect (and not too pricey) fondue recipe, and we finally settled on this garlicky cheese fondue from Emeril on The Food Network. It was delightful! Because of the cheese types, it is a very “American” fondue (unlike the more decadent Swiss or other imported cheese fondue, like last year’s!). But hey, cheese is cheese. 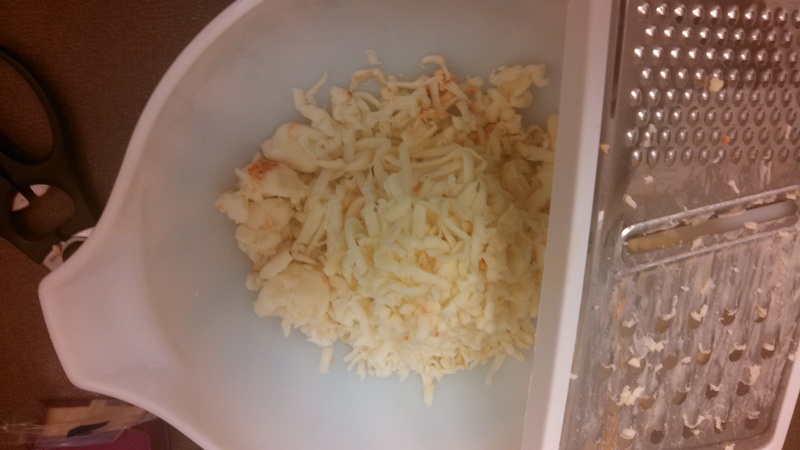 The Muenster cheese was very soft and a bit difficult to grate, as you may see in the pictures. I have not had Muenster in quite some time, and I taste-tested it, and honestly it’s not the greatest cheese on its own. It was a bit blah. But I figured that the softness of it would help it melt nicely into the fondue. The monterrey jack on the other hand, is a much firmer cheese, and packs quite a flavour! 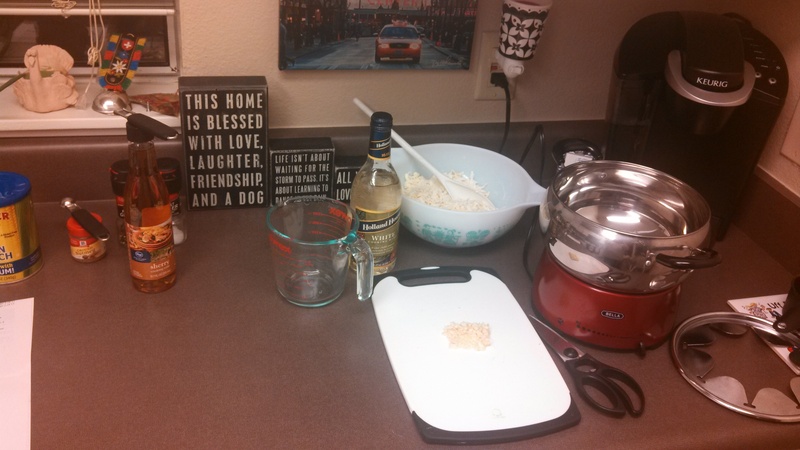 I did not go out and buy any special wine or sherry for the ingredients, instead I used store-brand white cooking wine and store-brand cooking sherry. They worked great! In fact, the recipe calls for kirsch (cherry brandy) but that is just a bit too high-maintenance for me (aka I have no idea if it’s at the grocery store, liquor store, the price, etc., haha), and I read that you can use sherry as a substitute. Additionally, I did not have any fresh nutmeg, so I used a bit of powdered nutmeg. The final product – complete with candles, and a rose from my husband! Additionally, I had read some of the comments on the original recipe’s website and I noticed that some people were really shocked by the garlic flavour. At first I was scoffing at that…I mean, 2 teaspoons is not that much. I use way more than 2 teaspooons of minced garlic in most dinners I make! BUT, the final product was definitely garlicky. We loved that! Once we got to the bottom of the pot, though, it almost became a bit *too* garlicky for some reason, but still delightful. 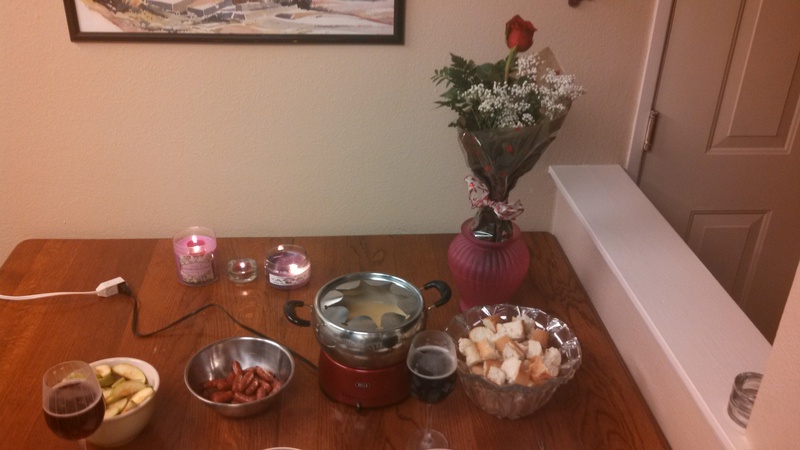 All in all, it was a great fondue dish and a great evening with my husband! Note: It will take a bit of time for the cheese to melt, and then for it all to thicken up, so don’t despair! I turned the heat up a bit higher than medium-low, cuz it would have taken FOREVER otherwise, but do whatever works best for your pot. 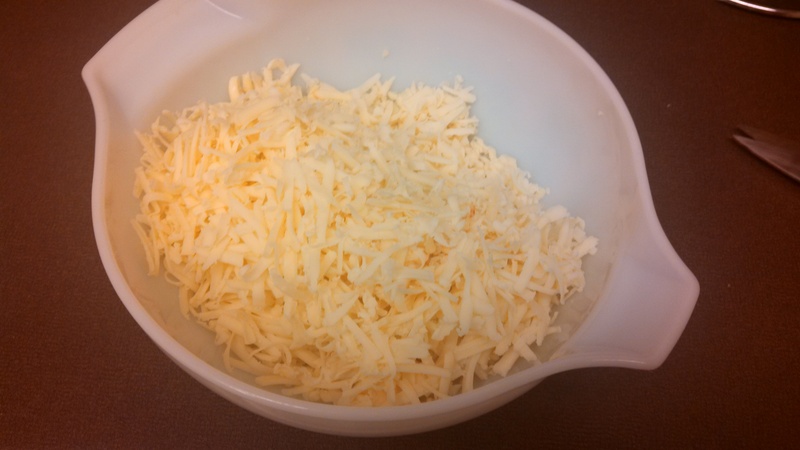 -In a bowl or large plastic bag, combine the cheeses and toss with the cornstarch to coat. Set aside until ready to use. -In a fondue pot or large heavy saucepan, bring the wine and garlic to a simmer over medium-low heat. Add the cheese a bit at a time, stirring well to prevent from clumping, and cook until melted. Add the kirsch, salt, pepper, and nutmeg, stir well, and cook stirring until the mixture is smooth, 3 to 5 minutes. -Adjust the seasoning, to taste. Set the pot over a candle or canned heat and serve hot with assorted dipping items.